The distribution of this species is greatly fragmented but remains relatively wide, much as it was historically. 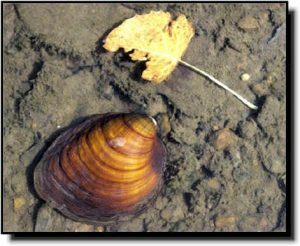 Long-term viability of many populations is questionable, especially those in large rivers where zebra mussel populations are now established; but outside these areas the species appears to maintain stable populations. It was historically distributed from New York and Ontario west to South Dakota, Kansas and Oklahoma, and south to Louisiana and Alabama. 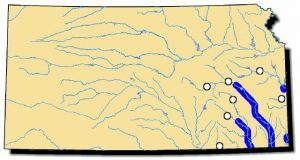 Large river populations largely eliminated in the upper Midwest, but many populations still survive in Mississippi and Ohio River tributaries. A long-standing population exist in the Poteau River and tributaries, Arkansas and Oklahoma. The current distribution of the Round Pigtoe is similar to the historical range. In Canada Pleurobema sintoxia is only known from southern Ontario including the Thames River. Recently this species has been confirmed to be nearly extirpated in the main channel of the Detroit River between Lake St. Clair and Lake Erie, Michigan/Ontario; due to zebra mussel invasion. Comments: This mussel is most easily confused with the Wabash pigtoe, although the round pigtoe is typically darker, less flattened and has a higher umbo than the Wabash pigtoe. Also, the younger round pigtoe has noticeable dark greenish rays that radiate from the umbo region. If identification is still in question, the pigtoe can be slightly pried open to examine the internal tissue coloration. The foot of the round pigtoe is light tan-gray to white while the Wabash pigtoe has an orange cast. The nacre in the round pigtoe is usually white, but pink, rose and salmon colors can be found in limited numbers and make the shell interior very striking. The round pigtoe appears to be declining across its range. In Kansas, however, its population may be increasing in the Verdigris River.